All five roommates come along to see Schmidt honored, but the episode quickly splits them up. Schmidt heads home to Long Island with Louise (Nora Dunn, returning as Schmidt’s mother) with Cece and Jess in tow, each nursing her own anxieties. Cece tries to keep peace with Louise, who vies for primacy in Schmidt’s affections. Just being in New York feels like a comeback to Jess, who’s determined to keep her sour memories from spoiling the trip for everyone. Cut to Jess, not handling the deli. Meanwhile, Winston and Nick have been disporting themselves as “men of means” in Manhattan, blithely ordering up lobster after lobster, martinis and champagne, “and a telephone on a tray—rotary.” Like his mother with Jess, Schmidt tried to warn them—“This is New York City, a city only one Baldwin could afford!”—but soon they’ve spent every dollar they have, and they have to hustle up their fare to Long Island. Cut to Winston, handling the hustle. 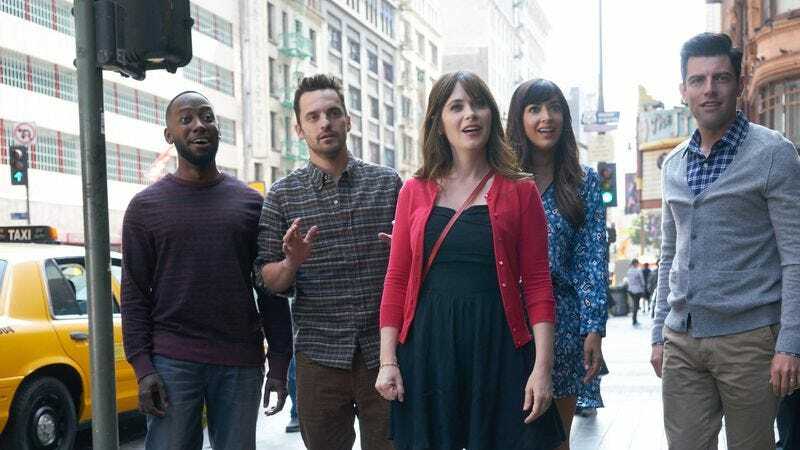 The busking scheme is the comic highlight of the episode, with Lamorne Morris letting Winston’s impromptu showmanship dissolve into doubt, then soaring into certainty, over and over. From this point, their B-story has a tenuous, fluid energy that suits the improvisational nature of the ruse and raises tension without contrivance or artificial drama. As Winston acts as barker for an act he hasn’t bothered to conceive, Nick chimes in, “Who wants to see what he’s going to do? I do!” Me, too, Nick! Me, too! The episode’s emotional weight comes from Jess’ realization in Raymond Holt’s office. Her last trip to New York was “a complete disaster,” but not that’s not why it haunts her. (“Did you go to the opera and were disappointed? It’s this new director,” sympathizes Captain Holt.) She hates New York because she cut short that trip… and caught her boyfriend cheating on her. A lousy few days in New York jumpstarted the first episode of New Girl. As always, Andre Braugher grounds Holt in calm authority and an earnest attempt at understanding, though Jess is impossible to understand. Suddenly pausing in her reminiscence, she asks, “That’s when that was?” With serene, hilarious sincerity, Holt answers, “Obviously I don’t know, because I have no idea what you’re talking about.” Braugher is the best thing to happen to a sitcom for years, which is something I never thought possible while I was watching Det. Frank Pembleton cerebrate, antagonize, and agonize for all those years. “Homecoming” is stronger on a second viewing, when the viewer is no longer bracing for the possibility of clumsy, forced connections between the two casts. That’s too bad for its initial run, but bodes well for syndication and long-term streaming. Like Schmegelman’s deli, any given fictional world has its own arcane set of rules and realities that are immediately apparent to those familiar with that world and its characters, but likely incomprehensible to those just stepping into it. New Girl’s and Brooklyn Nine-Nine’s showrunners and writers worked diligently to capture each others’ characters and comic beats, and it shows. The stinger with Coach rounding a corner to see his five friends, making an unannounced visit to his new home, lampshades the artificial world-shrinking a crossover episode can be guilty of. He’s not mad they didn’t call; he’s been to L.A. five times without telling them. “I’ve got other friends!” he cheers, coming in for a group hug. I linked to it above, but be sure to check out LaToya Ferguson’s review of the Brooklyn Nine-Nine half of this crossover!